When the speakers were announced in mid-August for the upcoming ConvergeSouth conference in North Carolina, the Schenkers were thrilled to accept the invitation to present at the conference. The conference, founded in 2004, is one of the pre-eminent technology conferences in the Southeast so what a privilege it is to be included. This is also the first time in ten years that the conference is returning to Winston-Salem, NC, the home base of Cover Story Media®, Inc. so it was an easy yes! The 2014 conference will be held on Friday, October 17, 2014, at Wake Forest University’s School of Law. If you missed it, check out a recap of their presentation below via Slideshare. And, how to work with your spouse! Michelle and Alex invite you to join them to find out how you could spend more time with your family and doing what you love vs. sitting in your dingy old cubicle while your manager watches your every move over your shoulder. You will need to buy a ticket to get in to this and all the other great sessions of tech learning for the day. 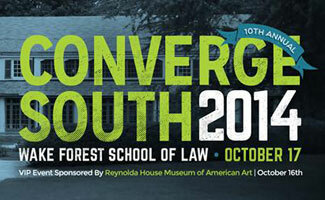 Visit the ConvergeSouth website to learn more about the conference and buy your ticket. What are your remote work tips?